24-009-AB-04 Black Candee Airbrush Base 4 oz. 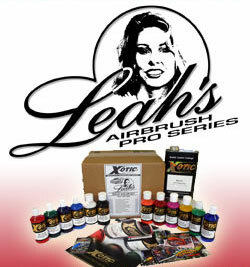 24-180-AB-04 Purplee Night Candee Airbrush Base 4 oz. 24-205-AB-04 Royalee Blue Candee Airbrush Base 4 oz. 24-220-AB-04 Blue Jeens Candee Airbrush Base 4 oz. 24-400-AB-04 Limee Green Candee Airbrush Base 4 oz. 24-500-AB-04 Firee Orange Candee Airbrush Base 4 oz. 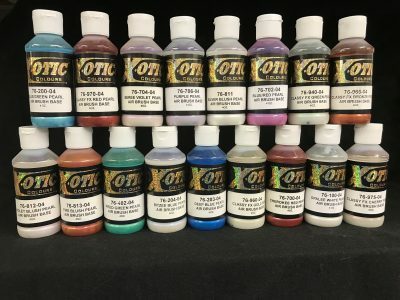 24-510-AB-04 Oreeole Orange Candee Airbrush Base 4 oz. 24-520-AB-04 Odysee Orange Candee Airbrush Base 4 oz. 24-610-AB-04 Trophee Gold Candee Airbrush Base 4 oz. 24-700-AB-04 Applee Red Candee Airbrush Base 4 oz. 24-500-AB-04 Reveered Red Candee Airbrush Base 4 oz. 24-500-AB-04 Rosee Pink Candee Airbrush Base 4 oz. 50-111-32 Fast Reducer 32 oz.